Government: Feudal alliance of semi-autonomous city-states and manorial estates all of which are under the ultimate control of the Duke of Metamor. Climate: Cool with long winters and wet springs and fall. Real life counterpart is Northern Europe or Michigan in the U.S.A. Borders: East: Great Barrier Mountain range, West: Great Barrier Mountain range and and the Sea of Stars, North: giantdowns, South: Southern Midlands. Economy: Trading, Farming, hunting, herding, fishing, as well as Kelp and Sea grass harvesting along the coast. Note: Map is at bottom of page. Please be advised that the map does have some discrepancy issues. Description:The Northern Midlands is most well known for Metamor Valley and Metamor Keep but it does encompass a considerable amount of other territory and people. Flora & Fauna: There is a considerable amount of marine life along the coast. Most notable is the presence of large numbers of seals and sea lions. Seals: the coastline is host to several large colonies of seals of several species. There are several offshore islands that are used as a nurseries in the breeding season. Others play host to large numbers of seals year round. In 920CR several of those islands will be declared off limits to all people creating marine sanctuaries for the seals. Droulee: The name translates to Drowned ones. These are perfectly normal seals whose faces do bear a striking resemble to a human face. Local superstition says they are the descendants of the drowned city of Ceasarath. Hunting them (or even harming one) is considered very bad luck. Silkie: See silkie This race of Seal people are known to live in the area. Little is known of them but at least 1 village is suspected of being along the West coast of the Dragon mountains. More are suspected on the countless, outlying islands. Some claim that the Silkies are the descendants of Ceasarath. Something the Silkie deny adamantly and claim to have only came to the area in 350CR. Fairly peaceful people but well capable of defending themselves. They have little contact with the local humans and their feelings towards Seal Keepers is unknown but both sides are known to be very interested. Metamor river: Where the river empties into the Sea of Stars are many rocks and dangerous currents which keeps the area from developing into a major seaport. At the moment there are some 10 villages and towns in the area where people make a living mostly from fishing. There is a small settlement of marine based Keepers (dolphins, seals, whales etc …) who have settled there and help the local fisherman with their catch. they also make a good living acting as guides for ships trying to avoid the larger rocks. Suielman Empire: The Northern Midlands was once the province of Maractania whose capital was at Camulodunum. See Metamor Valley under the Suielman for more details. The Seven Barrows: Located south of Midtown. It is a tall barrow (burial mound) surrounded by 6 smaller ones. On top of the middle hill is a large wooden column. These mark the place where the 71st Legion fought and died in CR 150+. 71st Legion: This legion was stationed in what is now Giftum in CR150+ when the Invasion of the Midlands took place. This unit made an epic march across the Northern Midlands to help defend the valley. They arrived too late. They were just south of what's now Midtown when they found themselves facing 100 times their number of invaders. With retreat impossible they closed ranks and fought to the bitter end. Believed to have held up the invasion for an entire day. As important was the warnings they sent out in all directions that gave many people valuable time to flee or prepare for the assault. When Prince Ovid's forces moved into the area to reclaim it they found the Lutins themselves had raised a large wooden memorial in memory of the legionnaires who had 'Fought like Wolverines'. This was partly admiration for such ferocity and partly to placate the spirits of the dead soldiers. The monument (much repaired) stands to this day. It is worth noting that the locals consider the monument and the surrounding area haunted and carefully maintain it. Some believe that had the legion arrived a day before they might have helped prevent the breakthrough. Most think had they arrived sooner they wold have simply died that much sooner. The monument is in the middle of an open field some 20 miles south of Midtown. Tearmann Marsh: (this entry is a work in progress). Located south of Laselle. The marsh itself is a mix of swamp, streams, slow moving rivulets, rivers. small islands and mud humps that are an equal mix of earth and water. Interspersed with all of that are islands of grass and brush and dense stands of trees. Any movement through that is impossible. A person would sink up to their hips in mud that seemed to be everywhere. Long known as a refuge. When the Suielman invaded the Northern Midlands Centli survivors fled into the marsh. Centuries later when the Lutins invaded surviving Suielman also fled to the marsh. A community of people still live there. It is effectively impassable to armies. The one Suielman road that runs north from Kormley detours around the marsh. Legends speak of a Lutin tribe that took refuge there but it's never been proven or disproved. The marsh sits at one end of a short branch of the Metamor river. In the past the main branch of the Metamor river ran past this way. But at some point the river changed course and now follows it's current path to the sea. Why the change happened remains unknown. When it happened also remains unknown. Some legends speak of a cataclysm (exactly what changes from tale to tale). Other legends say it was deliberately diverted by (insert some group long dead here - Tened, Sueliman) for reasons unknown. Others think it changed course as part of some natural process. Rivers do change course. Hansoran League: A Business guild of the most successful and powerful merchant families/companies of Menth. They have offices scattered all over the coast as far south as Whales. The League keeps its interests limited to commerce and trading and stay out of politics as much as possible. They make a good amount of money from trade with Metamor and have done their best to stay on the Duke's good side. Their trade caravans are a common, if little noticed sight in Metamor. Sorina Company of Merchants: A Business guild of the most successful and powerful merchant families/companies of Sorin. Started as a direct competitor to the Hansoran League. Not as big as the League it is still wide spread and has offices/trading posts scattered all over the coast and the Midlands. They do more land based trading than the League. Their caravans find their way all over the Midlands including Metamor. 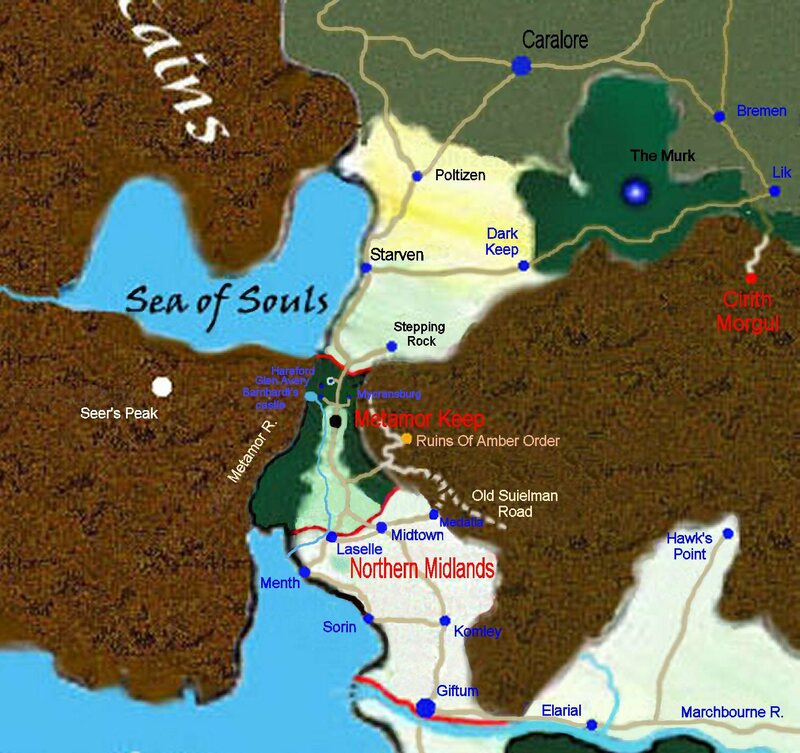 Southern Midlands takeover: The nations of the Northern Midlands have always been restive under Metamor control and are always pushing to gain more independence or come under the control of the southern-midlands and Duke Verdane. With the curse taking hold this has grown in intensity and is a serious problem for the duke. Pirates: where ever there is trade there will be people who want to steal it. Pirates are a small but constant issue in the area. Bandits: The land version of pirates and just as vicious and greedy. There is a very disturbing trend of bandits raiding into the southern end of Metamor Valley. It is unconfirmed but believed that these raiders are working with the help of some nobles outside the valley. The nobles are either greedy and see a chance for quick riches or see a chance to gain more independence from Duke Thomas. Whatever the reason it has raised trouble in the region and is seriously short sighted thinking. 1) Midtown take over: Geoffrey Donel - the ruler of Midtown is ambitious and wants to be more than a vassal of of Metamor. He would prefer to see the northern-midlands ruled by him. Not everyone agrees with this of course. Relations between Metamor Keep and Midtown have been tense at times. During Winter Assault the Baron was a little less then enthusiastic about sending troops to help. 2) Menth and Sorin Competition: Two seaport cities located close together is bound to lead to trouble. Menth has a larger harbor but Sorin is better placed to handle traffic to the Midlands. The two cities do have a fierce competition going and Sorin has even started a trade league of their own Like the Hansoran League. 3) Menth and Sorin are both in competition with each other for any trade they can especially the trade with Metamor Keep but both are united on one fact. Neither likes attempts by Midtown to dominate the the Northern Midlands. It is not by accident that a road leads straight from Menth to Metamor bypassing Midtown completely. This allows Menth to avoid Midtown patrols and taxes. Even caravans from Sorin routinely use the road (after paying a suitable fee of course). This of course has Midtown upset as they see it as cheating them of their rightful taxes and it keeps them from fully controlling all trade with Metamor. If both cities were to stop feuding and join forces it would make for a very formidable and very powerful organization. A fact that is starting to be taken seriously in both cities. Ceasarath: Legends speak of a lost Suielman city called Ceasarath that sunk beneath the waves centuries ago. The legend is that in 150CR when the lutin hordes approached the mages of the city sank it into the ocean rather then let it be destroyed by the invaders. Local fisherman say that the people were all changed into seals and their descendants still live there. There is a considerable number of seals living in the area and some offshore islands are used as a nurseries in the breeding season. No one considered the legend true but the arrival of the first seal morph Keeper did cause a VERY big commotion until things were explained. There is a colony of Silkie living in the area and some claim they are the descendants of the lost city. But the Silkie themselves deny this. The truth of the lost city legend is unknown. The ironic part of the legend is that it is true - sort of. The city did exist and did not survive the invasion in 150. The ruins are located at the mouth of the Metamor river. Where the river empties into the Sea of Stars the many rocks and shoals ARE the remains of the city. The ruins on land were long ago scavenged of useful stone. Only a handful of half submerged wharves hint at the city's location. Once the ruins are discovered they will become the target of a long running (200+ years) archaeology excavation on both land and sea that will wind up exploring and mapping most of the destroyed city. But what happened to it's population and what destroyed and submerged the city remains a mystery. One Lutin legend has it that when their army approached the city the Suielman mages tried to summon an earthquake to destroy the invaders. But the spell got away from them and the quake engulfed the whole city instead. One odd confirmation is a geological survey done in 1210 will reveal a faultline running through the dead center of the city. (Real Life Counterpart is Caesarea in Israel. Which was also build dead square on a Fault line).